League of Legends is a multiplayer online battle arena video game developed and published by Riot Games. In League of Legends, players assume the role of a summoner who controls a champion with unique abilities to battle against other players. The goal is to destroy the opposing team’s nexus. The game has an active competitive scene including the League Championship Series organized by Riot Games. The 2017 World Championship garnered more than 60 million unique viewers and had a total prize pool of over 4 million USD. 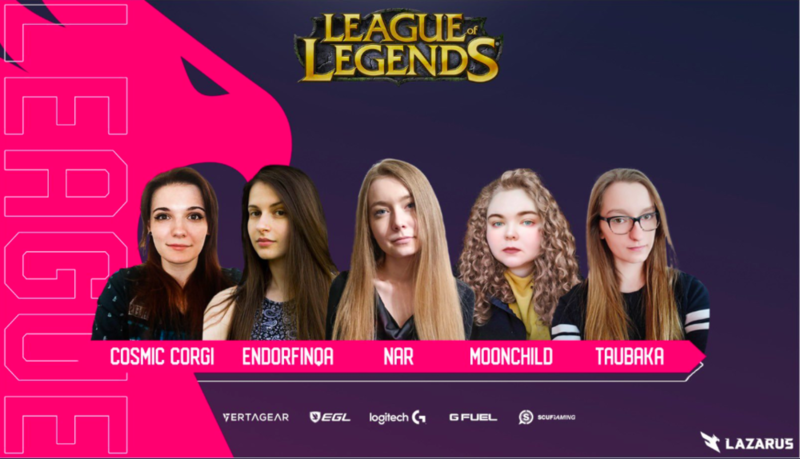 The Lazarus League of Legends team is based out of Poland and has been together since November 2017, with one member residing in Scotland (United Kingdom) and will first be competing in the Women’s Esports League to showcase their talent from March all the way to the end of April. Their past accomplishments include taking top 8 at the LaLigue Feminine playoffs and 1st place at the WEL Qualifier #1. Their goals are to become the best female team and to compete at the highest level in Poland.